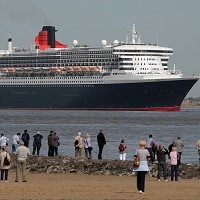 Abu Dhabi has received its first visit from Cunard Line's luxury flagship the Queen Mary 2 with the vessel docking at the Port Zayed cruise terminal. Built in 2004 to replace the famous Queen Elizabeth 2, the US $800 million cruise liner is stopping off at the port prior to setting sail for Cochin in India. More than 2,500 passengers arrived in Abu Dhabi aboard the liner, and tourism officials hailed the arrival as key in their ambitious strategy to greet 180,000 passengers in the current cruise season. Cruise holidays offer both luxury and variety to passengers, but before stepping on-board people can arrange cruise travel insurance for added peace of mind. The passengers spent the day sightseeing in Abu Dhabi, taking in the Sheikh Zayed Grand Mosque among other locations. Leisure Product Development Manager for the Abu Dhabi Tourism & Culture Authority Noura Al Dhaheri claimed Cunard only selects the very best destinations for their world cruises. The stop off at Abu Dhabi is part of the Queen Mary 2's 2013 World Voyage, a 106-day luxury voyage starting from Southampton. The round trip takes in the Mediterranean and the Red Sea before crossing the Indian Ocean towards the Far East and China. Before returning to Southampton, the vessel stops off at Australia, New Zealand, Mauritius and South Africa.